It’s never too early to become an anti-slavery campaigner! Across the UK, schools, teachers and students have powered the anti-slavery movement, supporting us with funds, energy and a passion for freedom. 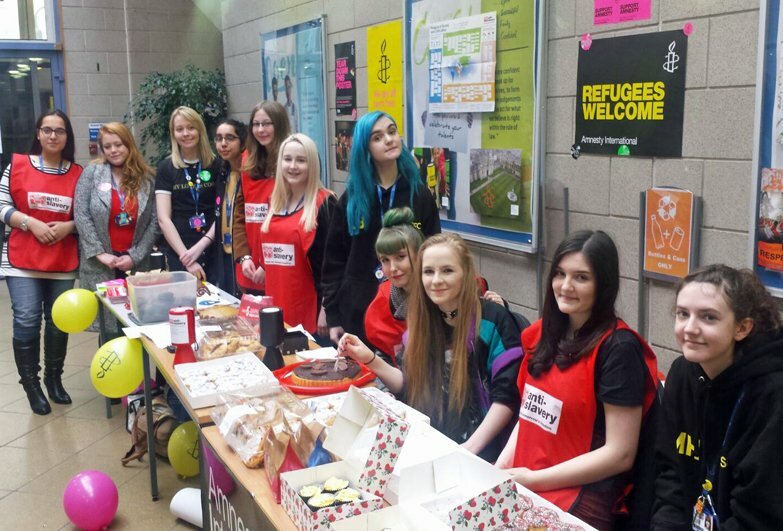 This year, students from Oldham Sixth Form College came together to raise funds and awareness on behalf of Anti-Slavery International. Starting with a cake sale and awareness-raising event in their college, they were interviewed for their local paper ‘The Oldham Chronicle’ and ended with a trip to London to meet their MP, Debbie Abrahams. This year alone, we have supported students and teachers to arrange bucket collections, letter-writing events, bake sales, and sponsored walks. You too can mobilise and organise actions in October and March as part of our ‘Fundraise for Freedom’ drive on Anti-Slavery Day (18th October), Black History Month (October), the day of Remembrance Day for the Victims of Slavery and the Transatlantic Slave Trade (25th March).